It’s the end of May. If all has gone as planned the Romney ewes are now “in lamb” and will spend the winter getting on with their pregnancy. The Merino rams are removed and returned to the peace and quiet of the ram-paddock until their services are required again next Autumn. What a season it has been. Ewes are separated into 10 or so “mini flocks” of about 80 sheep. A stud Merino ram goes with them. At the end of the mating season, each mini flock is brought into the barn, and all the ewes have their eartag number recorded next to the name of Their Ram. Here comes one of the mini flocks towards the barn to have their numbers recorded, and their ram taken away. It is a chilly minus one-degree centigrade, and you can see heat rising off the Ewes as they come up the driveway towards the barn. 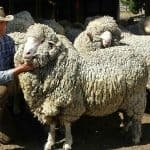 The Merino rams used in this breeding programme come from well known and respected Australian stud breeders, and are selected for desirable genetic characteristics to be introduced to the flock as a whole. Each ram is known by the name of the stud he came from. Occasionally, a ram will also have his own name. This year Johnny Duncan, the farmer has a soft spot for a ram called Cheetah, who is very tame and friendly. He comes from the “Terrick West” stud. When the lambs are born in October, they are ear-tagged within two days of birth, so that both parents are known. Johnny can’t wait to see what Cheetah’s progeny are like. 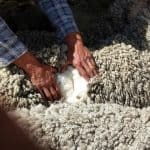 Watch this space………..
delighted to have seen Maniototo wool !